Australian Catholic University has awarded Kate Gavin, a third-year bachelor of nursing student, the 2018 Francis Xavier Conaci scholarship, which will assist her to study at the university’s Rome campus. Ms Gavin, an Indigenous student at ACU's Brisbane campus, was presented with the scholarship overnight at a ceremony in Rome hosted by ACU and the Australian embassy to the Holy See. The Francis Xavier Conaci scholarship enables an Aboriginal or Torres Strait Islander student to undertake study in Rome. Ms Gavin’s grandfather was part of the Stolen Generation and knew little about his biological family. He was taken from his mother and raised in an orphanage in Perth. Despite this, Ms Gavin and her family have managed to stay connected with family in Perth and their Indigenous heritage. Director of the First Peoples and Equity Pathways Directorate at ACU Jane Ceolin said she was pleased that a female student was chosen this year in light of the NAIDOC theme for 2018, "Because of Her, We Can!" 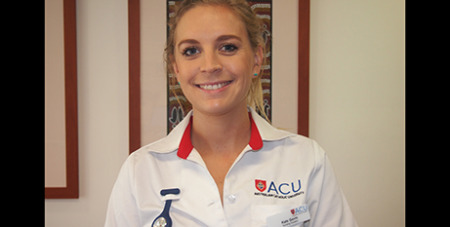 Ms Gavin said she was delighted to receive the award and that she was excited to be studying at the ACU Rome Campus. “I feel honoured as a woman of Aboriginal heritage to receive this scholarship and to engage in a unit of study that looks at the disadvantage experienced by people all over the world, in particular indigenous communities,” she said.